Jack Kerouac led a busy life boozing, writing, bee-bopping, and banging Neal Cassady's wife, but he was also quite the nerdsworth when it came to fantasy baseball. Heavy emphasis on the "fantasy." Based on the new book "Kerouac At Bat: Fantasy Baseball And The King Of The Beats" we find out that Kerouac obsessively maintained a fantasy team from his teenage years up until the time of his death with a fictitious league featuring teams like the "New York Chevvies" and the "Cincinnati Blacks." 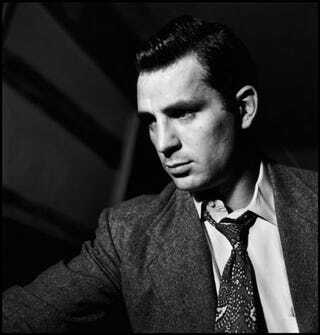 The book claims that Kerouac kept this side of his life a dirty little secret, especially from his too-cool-for-school friends like Allen Ginsberg and William Burroughs. "I don't think the others knew. Or if they did, they didn't learn it from Kerouac. I think he was worried they might think it childish." If only Kerouac were still alive today to do podcast chats with Matthew Berry.